Hour glass style holds up to 6 lb. of seed. 5 tier feeder has two perch rings and a tray at base. Holds up to 5lb. of seed. Three tier with tray at base. 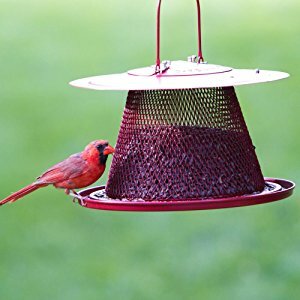 The cardinal feeder has a wide tray at the base that cardinal prefer. NO/NO stands for no wood, no plastic. These durable long lasting wire mesh feeders have been around for as long as I can remember. The diamond mesh make these feeders great for black oil sunflower but they can also be used for a shelled peanuts or our woodland blend. They come equip with perches but the wire mesh lets birds cling strait to the feeder at any point and feed. This allows more birds access to the feeder. 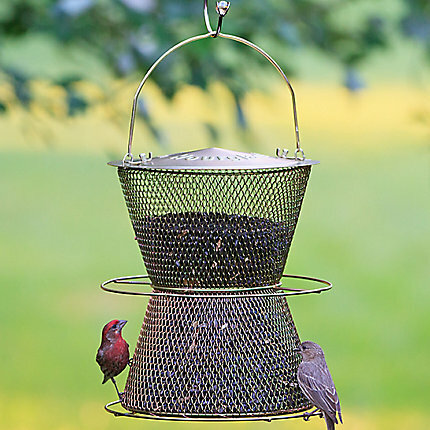 The wire mesh also allows this feeder to fold flat for storage when not in use. With four sizes to choose from one of these feeders would make a great addition to your bird feeder collection. We are running a over stock special on NO/NO feeders!